On the mentioned date and time, Deschutes County Sheriff’s Office Search and Rescue personnel were dispatched to assist Elk Lake Lodge in the transport of a female patient that had been injured in a snowmobile accident the day prior. Elk Lake Lodge personnel advised Fiala was renting a cabin with her family. The accident was reported to have occurred near Todd Lake where Fiala crashed her rented snowmobile between two trees at about 1030 hours. The accident was not initially report, but Fiala realized this morning further medical assistance would be needed. This process was complicated by Century Dr being closed for the winter season, open only to snowmobiles, skiers, etc. A SAR team of 4 and 1 SAR Deputy rode snowmobiles to Elk Lake Lodge, with one of the snowmobiles pulling an ambu-sled for the patient. Upon arrival of SAR resources at about 1215 hours, it was determined after a medical assessment, Fiala should be transported by Air to St Charles Medical Center. Life Flight was dispatched to Elk Lake Lodge landing at the intersection of Century Dr and the entrance to Elk Lake arriving at about 1320 hours. Fiala was transported to St Charles Medical Center for non-life threatening injuries. On 01/07/2016, at about 5:20 P.M., Deschutes County Sheriff’s Office Search and Rescue (DCSOSAR)was dispatched to a report of a lost subject that had been hiking in the area of the Metolius-Windigo Trail about 1.5 miles north of Three Creek Lake. The reporting person, Stevens, reported that her son, Neason, had decided to go for a hike while he was waiting for Stevens and Rhinehart to arrive with snowmobiles, after which they were going to ride together. Neason parked his vehicle at the Upper Three Creek Snow Park at about 1200 hours and walked up towards Three Creek Lake where the plan was to meet at the junction of Rd 370 and Rd 16, Three Creek Road. Upon arrival of Stevens and Rhienhart about 2 hours later, they learned Neason was currently lost, but believed he was in the area of Snow Creek west of Rd 16. Stevens and Rhienhart drove back down to the Upper Three Creek Snow Park where they waited for LE arrival. A USFS LEO responded to the snow park and provided updates that Stevens would periodically receive from Neason via text messages. Neason was able to report he had been walking in 3 foot deep snow, was wearing tennis shoes, blue jeans over laid with carhart pants, a sweat shirt and a Carhart jacket. Neason was reported to have a means of starting a fire. Attempts to call and or text Neason by LE were not successful. Neason was able to call 911 at about 5:46 P.M. It was learned Neason was dressed for an overnight stay, but was now wet. Neason also advised he had food and water. Dispatch was able to obtain an accurate ping of Neason’s location which put him near the Metolius-Windigo Trail about 1.3 miles NW of Three Creek Rd. Neason called 911 again at 7:15 P.M. to state he had stopped walking, had been able to build a fire and was cold. Based on the ping of the phone this time, the coordinates showed that Neason had walked about 200 yards downhill in a NE direction. Three DCSOSAR snowmobiles, one towing an ambusled and 5 SAR members were deployed to the Upper Three Creek Snow Park parking lot arriving at about 8:00 P.M. From there snowmobiles were needed to travel the distance of about 3.5 miles to the intersection of the Metolius-Windigo Trail. Snowmobiles needed to then travel off trail to the west towards the GPS coordinates through narrow stands of trees and blow down. At about 9:30 P.M. Neason was able to call 911 again to state he had been able to start a fire, which had since began to die, but the embers were helping his feet from getting too cold. The ping on the phone confirmed Neason had not moved since his prior 911 call. SAR personnel located Neason at about 10:20 P.M. Neason was provided warm fluids and was wrapped in a couple of sleeping bags and transported back down to the Upper Three Creek Snow Park in the ambusled. Neason was released to the care of Stevens and Rhienhart. Occurred: 11/18/15 @ 4:27 p.m.
On 11/18/2015 at about 4:27 p.m., Deschutes County Dispatch received a 911 call of a missing three year old boy in the China Hat Road area. The reporting party, Ryan Duffey, advised he had been woodcutting in the area with his family and his son had gone missing from the area of Forest Service Road 1816 and the 900 Spur Road. 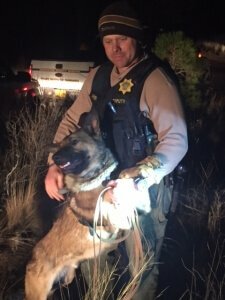 Twelve deputies (including two K9 units) and twenty Search and Rescue (SAR) volunteers from the Deschutes County Sheriff’s Office as well as Forest Service Law Enforcement Officers and Oregon State Troopers responded to the area to look for the missing boy. Due to dusk quickly approaching and with temperatures nearing freezing, two deputies, along with K9 Ezel were immediately deployed to search the area. K9 handlers were directed to an area about 200 yards northwest of the woodcutting site and located the boys’ shoes. Handlers began to track the toddler to the northeast from that location. During the track, they located intermittent footprints they believed were the boys’. They continued to track him in a northeasterly direction and at about 5:54 p.m. located him about two miles from the woodcutting area. Search and Rescue medical personnel responded to their location and began to assess him. He was cold but otherwise in good health. SAR personnel wrapped him in heating blankets and he was transported back to FS Road 1820 and reunited with his parents. On 09-25-2015 at about 1620 hours Deschutes County 911 received a call by cell phone from a climber (Kenyon) who was climbing the North Sister and fell. Kenyon was able to stop his fall with an ice axe and is currently holding in place. Due to Kenyon’s location and injury he is unable to self extricate and requested a SAR response. The Deschutes County Sheriff’s Office Search and Rescue Unit was activated and a two man Mountain Rescue Team was flown by Air Link to near Kenyon’s location to stabilize and assess the situation and Kenyon’s medical needs. More to follow as this mission develops. As of 1948 hours two DCSO SAR Mountain Rescue Teams are on the ground and making their way to Kenyon. A National Guard helicopter from Salem has been requested and will be enroute to the area within the hour. Details of Kenyon’s fall are unavailable at this time. More details of this mission will be released as time and the situation allows. On 09-25-2015 at about 2100 hours, Kenyon was located by the National Guard rescue helicopter and hoisted aboard. Kenyon was evaluated by on board medical personnel and it was determined that he would be transported to St. Charles Hospital in Bend. The extent of Kenyon’s injuries are unknown at this time. During this rescue Kenyon was able to stay in contact with his rescuers by text message. With the assistance of Air-Life the Deschutes County Sheriff’s Office Rescue teams will be extricated once they reach a safe landing area for the helicopter. On Sept 3rd at about 2:30p.m. Deschutes County Search and Rescue received a request for help through Deschutes County 911 from an injured climber on the Asterisk Path at Smith Rocks State Park. A male climber identified as Peter Kettering had fallen about 15 feet while climbing and suffered ankle injuries. Two SAR teams consisting of 9 volunteers were dispatched with a wheeled litter to Kettering location. Once they arrived on scene, Kettering was stabilized, loaded into the wheeled litter and taken back to the main trailhead where he was transferred to Redmond Fire medics for evaluation and then transported to SCMC in Redmond by private vehicle. On the listed date and time the Deschutes County Sheriff’s Office Search and Rescue Unit received a call from Sara Ray reporting her husband, Christopher Ray, was overdue from his planned back packing trip in the Three Sisters Wilderness. Mrs. Ray reported her husband had planned a multi-day back packing trip in the area around the Irish Mountain Lake Loop, which she believed started near Cultus Lake. Mr. Ray began his hike on Friday, 09/04/15 and had planned on returning on Tuesday, 09/08/15. Mrs. Ray communicated with her husband via text on Saturday and Sunday and although the trip was going well, he thought he would be home on Monday, instead of Tuesday. Mrs. Ray did not hear from her husband on Monday and began to get worried about his welfare. Mrs. Ray reported her husband was an experienced back packer, was appropriately clothed for the weather and had food, water and supplies to last him well through Tuesday, 09/08/15. Without a known emergency, a plan was initiated to begin searching the described area the following morning. On 09/08/15, at about 1000 hours, a Deschutes County Sheriff’s Office Deputy located Mr. Ray’s vehicle parked at the Cultus Lake Trailhead. Mr. Ray’s cell phone was pinged and returned with a last known location about 15 miles northeast of the Cultus Trailhead, in Lane County. That location was the last activity associated with Mr. Ray’s phone and was logged on 09/07/15. Lane County Sheriff’s Office Search and Rescue as well as the US Forest Service were contacted and assisted with a road/trail search in the area of the cell phone ping location. With no roads available to access the area from the Deschutes County side, two DCSO SAR Volunteers were deployed on horseback from the Cultus Lake Trailhead. The DCSO SAR Horse team located Mr. Ray at about 1400 hours, about 1/3 mile south of Muskrat Lake on the Winopee Lake Trail. Mr. Ray was experiencing a medical emergency and was being assisted by three other subjects recreating in the area. Mr. Ray was unable to continue on his own. Seven additional DCSO SAR Volunteers and one DCSO Deputy were deployed to the area to assist with providing medical attention as well as a wheeled litter extraction. The Cultus Lake parking lot was determined to be the closest available landing zone for an air ambulance. The additional SAR Volunteers responded to the west end of Cultus Lake via vehicle and hiked nearly two miles to Mr. Ray’s location with the wheeled litter. Mr. Ray was secured in the wheeled litter and transported back to the west end of Cultus Lake, where a DCSO Marine Deputy was standing by to transport Mr. Ray across the lake. Air Link responded to the Cultus Lake parking lot and stood by for the DCSO Marine Deputy to arrive. Mr. Ray was transferred to the Air Link helicopter and flown to St. Charles Hospital in Bend with a serious medical condition. On August 23, 2015 at about 0834 hours Deschutes County 911 received a call from a citizen hiker in the Green Lakes area west of Bend. The citizen reported that he had located Nancy Allender of Eugene and her friend about 4 miles from the Green Lakes Trailhead. Nancy had a non-life threatening injury and was non-ambulatory. Two Search and Rescue teams assembled and proceeded to Nancy’s location along with medical supplies and a wheeled litter to transport Nancy back to the trailhead. The search and rescue teams stabilized Allender and transported her on the wheeled litter to the Green Lakes trail head. Once at the trailhead Nancy was transported by her friend to Eugene for further medical attention. On the listed date and time the Deschutes County Sheriff’s Office Search and Rescue Unit received a call from a hiker, Searfus, stating his friend, Clark, had fallen and injured himself in the area of Golden Lake. Searfus reported Clark could not walk on his own and would need assistance in getting back to the Park Meadow Trailhead, where their vehicle was parked. Searfus and Clark were part of a group of 5, who were camping at Golden Lake and advised it would be about a 6 mile hike to their location from the trailhead. Park Meadow Trailhead is accessed by traveling approximately 15 miles south of Sisters, OR, on Forest Road 16 (Three Creeks Rd). Accurate GPS coordinates were obtained from Searfus’ cell phone to help confirm the hiker’s location. 9 Deschutes County Sheriff’s Office SAR members were deployed with a wheeled litter at the Park Meadow Trailhead at about 5:35 P.M. The wheeled litter breaks down into three parts to enable its transport into the back country more efficient. SAR members located Clark at about 8:27 P.M., completed a medical assessment and confirmed his non-ambulatory status. Clark’s medical condition, in addition to the hours of complete darkness soon approaching, determined transport via an Air Resource would be best. Clark was packaged in the wheeled litter and was transported about 100 yards to an appropriate landing zone. Life Flight was dispatched to the location at about 9:40 P.M., but half way there, had to turn around because of thick smoke that had blown into the area as a result of current fire activity outside of Deschutes County. The initial 9 SAR members began to transport Clark back to the trailhead via wheeled litter. 8 additional SAR members were deployed to the area to assist in the return transport, that was going to require several stream crossings and the nearly 6 miles back to the trailhead. Life Flight advised at about 1:00A.M., visibility had improved enough to transport the patient via air. By this time an appropriate sized landing zone was not available, based on the terrain in the area they had progressed to. The SAR teams continued the wheeled litter transport until arrival at the trailhead, at about 3:52 A.M. Sister’s Fire personnel were standing by at that location to transport Clark to St Charles Medical Center, where Clark was treated for a serious, but non- life threatening injury. On July 28th at about 0920 hours, the Deschutes County Sheriff’s Office Search and Rescue Division received a call from a hiker, who was in the area of south Green Lake. The reporting party said he had come across Keya Mitra, who was “wandering around” the area of the Green Lakes camp sites. Mitra had told the reporting party she had been hiking alone in the South Sister area the previous day and had fallen several times, becoming disoriented. Mitra had further stated she had been walking in the area all throughout the night. The reporting party was concerned enough about Mitra’s condition he committed to stay with her until DCSO SAR personnel arrived. Fourteen DCSO SAR Volunteers were activated, arriving at the Green Lakes Trailhead at about 11:15am. While at the trailhead, DCSO SAR Volunteers contacted a male subject, who had just arrived and was identified as Mitra’s boyfriend, Alan Luik. Luik reported Mitra having been in contact with her family the previous evening at about 7pm, stating everything was going well and that she would be back in contact with them by 10pm. Mitra was not heard from again, at which time family began communicating with Luik. Luik at some point drove to the Green Lakes Trailhead and was preparing to search for Mitra when he met up with SAR Volunteers. At no time did Luik or Mitra’s family contact law enforcement. DCSO SAR Volunteers then hiked about 4.3 miles (packing a wheeled litter), arriving at Mitra’s location at about 12:45pm. The SAR Volunteers assessed and reported Mitra’s physical condition at which time it was decided she would be transported via wheeled litter back to Green Lakes Trailhead to be further evaluated by Sunriver Fire personnel. DCSO SAR Volunteers arrived at Green Lakes Trailhead with Mitra at about 3:37pm, transferring her care to Sunriver Fire personnel. Sunriver Fire personnel then transported Mitra to St. Charles Hospital in Bend for further evaluation. Details of Mitra’s planned hiking activity the previous day are still not fully known. Mitra was in possession of a day pack, but it was not her intent to stay overnight in the wilderness. It is unknown if she had the 10 Essentials for Wilderness Survival, which would include sources for: navigation, sun protection, insulation, illumination, first-aid supplies, fire, repair kit/tools, nutrition, hydration and emergency shelter. The Deschutes County Sheriff’s Office Search and Rescue Division would encourage individuals recreating in the wilderness, not to do so alone if possible. Always include friends or family members in on your recreating plans and ensure they know to call the appropriate law enforcement agency in case of an emergency. On July 2nd at about 0920 hours Deschutes County 911 received a call from International Emergency Response Center (“GEOS” www.geosalliance.com) asking for assistance for one of their clients (Ravencraft) that had activated a text message capable emergency beacon. Ravencraft had indicated to them via text message that she had been hiking with her Mastiff service dog, had fallen was injured and non-ambulatory. Ravencraft’s coordinates showed that she was just west of Yapoah Lake. Deschutes County Sheriff’s Office Search and Rescue responded with 1 on scene Sergeant, two 4-person teams and one 2-person horse team to the injured hikers last known location. At about 1:00 pm Deschutes County Sheriff’s Office SAR teams reached Ravencraft. SAR medics evaluated and stabilized Ravencraft and have prepared her for extraction. A Black Hawk Helicopter from the Oregon Air National Guard has been requested and is responding at this time. At about 3:00p.m. an Air National Guard Helicopter left the Salem airbase in support of the Deschutes County Sheriff’s Office SAR Incident Commander’s request. Aircraft support requested for Search and Rescue mission in Deschutes County. Aircraft is a HH-60M Blackhawk. The aircraft belongs to the Oregon Army National Guard, based at Army Aviation Support Facility #1, in Salem, Oregon. The HH-60M Blackhawk has the primary medical mission equipment (medevac version) for Oregon Army National Guard. Black Hawks with medevac crews carry out medical supply runs and transport the wounded to combat hospitals. Described as the emergency room of the skies by the military, they also serve as airborne ambulances. They are equipped with oxygen, various monitors and a defibrillator, and one medic is attached to each four-person crew. The aircraft can be configured to carry four stretchers by removing eight troop seats. The Oregon National Guard is comprised of nearly 9,000 Citizen-Soldiers and Citizen-Airmen. At approximately 4:00p.m. the aircraft reached the designated extraction point and Ravencraft was hoisted out of that location and transported to Eugene’s RiverBend hospital for medical care. Ravencraft’s Mastiff service dog was taken by rescue personnel to the Deschutes County Sheriff’s Office station in Sisters where it was released to a close friend of Ravencraft’s from Eugene. The Deschutes County Sheriff’s Office Search and Rescue would like to thank the Oregon National Guard for their assistance with this rescue. Date: 06/17/15 at 11:45 p.m.
On 06/17/2015 at about 3:00 p.m., Deschutes County 911 received a call from Sheets reporting her hiking partner (Horn) had become ill and needed medical assistance. Sheets reported the pair had been hiking for two days in the area and had covered approximately 20 miles the day before. Sheets and Horn’s coordinates location was determined by the phase II cell phone connection with 911. It showed that Sheets and Horn were on the Green Lakes Trail about 3 miles north of the intersection with the Pole Creek Trail. A team of 13 Search and Rescue volunteers hiked in nearly 5 miles from the Pole Creek trail head bringing medical supplies and a light weight metal liter with a single wheel and tire mounted to the bottom. Horn and Sheets were reached by the SAR team at about 6:10 p.m. Horn was evaluated by SAR medical staff and treated on scene. He was then secured in the wheeled liter and transported back out to the Pole Creek Trail head where he was turned over to Medics from Sisters Fire and Rescue. Horn was transported by Sisters Fire to St. Charles in Bend for additional observation and treatment. The Deschutes County Sheriff’s Office lifted all pre-evacuation notices at midnight. Shevlin Park Rd / Johnson Rd was reopened around 8:30 PM last night. A joint investigation including Oregon Department of Forestry, Bend Fire Department, Oregon State Police, and the Deschutes County Sheriff’s Office is underway. At this time, investigators report the fire is likely human caused, but have not determined if it is intentional or accidental. Anyone with information that may help the investigators is urged to contact the Deschutes County Sheriff’s Office at 541-388-6655 or Non-Emergency Dispatch at 541-693-6911. Are your gutters and roof valleys free from debris like pine needles and leaves? Clean them out. Despite a metal or asphalt shingle roof, the buildup of gutter debris provides necessary fuel for the glowing embers to ignite adjacent fascia boards or siding – most often made of wood. Is your woodpile near your home or other combustible vegetation? Move woodpiles at least 20 feet away from your home or other combustibles. We further encourage you and your family to have a plan, get a kit, and stay informed regarding known or potential hazards in your area. On 05/24/2015, at about 1718 hours, The Deschutes County Sheriff’s Office was dispatched to a report of a family that was hiking down South Sister and they could no longer see the trail. The reporting person, Wise, and father of 5 children, ages 6-15, who were hiking with his wife had called to report they had come up against a literal rock wall and the clouds had lowered so they could no longer tell which way to go. Wise advised they were dressed for the weather, had food and water and the means to start a fire. Wise informed dispatch they would travel a little further to the south east to a group of trees where he would start a fire. Attempts to contact Wise by phone were not successful after he had called dispatch. Attempts to text Wise were not successful either. Dispatch was able to provide fairly accurate GPS coordinates of where Wise had called from which showed that Wise and his family had gotten off the trail to west of the climbers trail by about .7 of a mile at an elevation of about 6500 feet. Accidently leaving the trail to the west in this area has proven to be a common cause of hikers becoming lost during this time of the year when the snow is still covering the trail especially with limited visibility. One USFS LEO responded to the Devil’s Lake TH and quickly hiked the climber’s trail to the last known coordinates in the attempt to locate the family before dark. 5 Deschutes County Sheriff’s Office Search and Rescue members were deployed to the same trail to assist the LEO in locating and assisting the family down the mountain. The LEO was not able to locate anyone at the last known coordinates, but did locate tracks that appeared to be the family’s heading south still off of the trail. It was soon reported the tracks began to lead towards the west, which raised the level of concern that the family would be pulled further to the west making the descent more difficult and more time consuming. At this time more SAR resources were beginning to be deployed to assist in the search. At about 2052 hours, Wise called dispatch to report the family had made it back to the Devil’s Lake TH and they were all OK, but wet. It was learned that Wise’s phone had died soon after calling dispatch. Wise was able to build a fire, but the weather cleared up soon after and he was able to see tracks leading in what Wise believed was the right direction. Wise advised he had not brought with him a map, GPS or compass or a means of charging his cell phone. Wise and his family turned around about a 1000 feet below the summit on this trip. The LEO ended up following the tracks left by the family on their descent which revealed that the family ended up coming down the mountain counter clockwise on the Moraine Lake Trail instead of on the Climber’s trail. The SAR team and LEO made it back to the TH at about 2130 and 2145 hours respectfully. The Deschutes County Sheriff’s Office would like to remind those who recreate in the back county to always be prepared for their plans to change at a moments notice. Always having The 10 Essentials with you will help ensure a successful back country experience. On 05/16/2015, at about 1311 hours, Deschutes County 911 received a cell phone call from Rosiell, that her friend, McCullough, had slipped on loose rock and injured herself while hiking on the Mesa Verde Trail on the west side of Smith Rock State Park. The hikers had been on their way down on a steeper section of the trail which was south of Monkey Face at the time of the injury and was unable to continue hiking. Redmond Fire Department Paramedics responded to the west side of Smith Rock accessing the opposite side of the Crooked River by the use of a large raft, then ferried 14 Deschutes County Sheriff’s Office Search and Rescue members upon their arrival. On 05/16/2015 at about 1554 hours, the Deschutes County Sheriff’s Office was dispatched to a report of a subject that had sustained an injury after falling on rocky terrain while on Lava Island. The reporting person, Davis, advised that Deacon had been in this area taking photos of Davis and 3 other kayakers going down Lava Island Falls when he slipped and fell. It was reported that the location was in a difficult area to access and the Deschutes County Sheriff’s Office Search and Rescue Swiftwater team may need to access the location by boat. Davis reported that Deacon may not be able to walk out without injuring himself further. 14 Search and Rescue members were currently enroute back to Bend after assisting Redmond Fire with a rescue at Smith Rock at the time of this call. These 14 SAR members responded to the Meadow Camp Recreation Site along with a SAR Coordinator and a USFS LEO. 7 DCSO SAR Swiftwater team members were currently training at the First Street Rapids in Bend and were deployed to assist. Upon arrival at Meadow Camp at about 1600 hours, the SAR teams were guided to the best access point to cross the river to Lava Island. Deacon’s injuries were accessed and he was able to walk out with the assistance of SAR members. The SAR Swiftwater Team’s boat was not needed, although a fixed line was placed across the access point on the river to aid in a safer crossing. Deacon was taken to St Charles Medical Center in Bend by his friends for treatment of his non-life-threatening injuries. On May 6, 2015 at about 7pm, Deschutes County 911 received a call from Joshua Klatt asking to be rescued. He and his friends had gone to the Paulina hot springs when the weather turned foul and they could not see the trail due to the high winds and blowing snow. Joshua relayed that they did not have any food, their clothes were wet and they only had towels. Deschutes County Sheriff’s Office deputies responded with a Deschutes County Sheriff’s Patrol boat. While en-route Sgt. Dozier was able to make phone contact with Joshua and urged him to build and maintain a fire which Joshua was able to do. The temperature had dropped to about 30 degrees with a wind chill of about 21 degrees. Deputies were able to locate Joshua and his companions via the fire they had built by the lake shore. All subjects were not dressed for the frigid weather and were shivering despite the fire. Joshua and his companions were transported back to Little Lava Campground and their vehicle and released. The Deschutes County Sheriff’s Office would like to remind recreators to always be prepared as the weather can change in an instant. Having a way to build a fire, warm clothes to put on, and a light source is always recommended. Also, keeping your cell phone charged, having high calorie snacks and water along is encouraged. On May 4, 2015 at approximately 0058 hours Deschutes County 9-1-1 received a report of an injury ATV crash that occurred on Boundary Rd in La Pine. Deschutes County Sheriff’s Office deputies responded along with the La Pine Fire Department. The initial investigation indicated that Chytka was southbound on Boundary Road when he was struck by a deer crossing the road. Chytka could not control the ATV after being struck by the deer. Chytka fell off the ATV and sustained injuries due to the collision. Chytka was able to return to his residence where he was met by Deschutes County Sheriff’s Office deputies and the La Pine Fire Department. The investigation revealed Chytka was not wearing a helmet and had suffered non-life threatening injuries as a result of the crash. He was transported to St. Charles Medical Center by ground ambulance where is currently listed in stable condition. Through the course of the investigation alcohol was determined not to be a contributing cause to the crash. At the discretion of the investigating deputies there were no citations issued. On 05/03/2015, at about 1024 hours, Deschutes County 911 received a cell phone call from a citizen who reported a female hiker had slipped on loose rock and injured herself while hiking on the Misery Ridge Trail in Smith Rock State Park. The female hiker was on her way down the steep section of Misery Ridge trail on the west side of Smith Rock just above Monkey Face at the time of the injury and was unable to continue hiking. There were 7 Deschutes County Sheriff’s Office Search and Rescue members currently at Smith Rock who had just finished a pack test of a distance of 4 miles with 2,000 feet of elevation gain each carrying 25% of their body weight with a maximum of 40lbs. These 7 SAR volunteers, assisted by a Smith Rock Park Ranger, became the hasty team deployed to locate the patient and it required them to hike up and over the Misery Ridge trail once again. 6 more SAR members responded from the Special Services building in Bend to assist. Redmond Fire Department Paramedics responded to the west side of Smith Rock accessing the opposite side of the Crooked River by the use of a large raft, then ferried the second group of SAR members upon their arrival. The patient, Cook, was evaluated by Redmond Paramedics, packaged in the litter, and then brought down the steep trail on a wheeled litter. On the steeper sections of the trail, the SAR members who did not have hands on the litter, were used as a walking belay with each of them having a hand on a line that was attached to the end of the wheeled litter to serve as a breaking system if needed. Cook and all other personnel were ferried back across the river at about 1330 hours. Cook was transported by Ambulance to St. Charles Medical Center in Redmond with a minor non-life threatening injury. On 04/26/15, at approximately 1544 hours, Mt. Bachelor Ski Resort contacted the Deschutes County Sheriff’s Office regarding a lost snowboarder. It was reported Andrew Wong had been snowboarding at Mt. Bachelor Ski Resort with two friends and was last seen at about 1220 hours before the group’s last run for the day. Wong’s friends lost sight of him at this point and began to look for him themselves, unsuccessfully. Wong texted his friends a short time later saying he was alright and had found a different area on the mountain that had fresh snow. Mt Bachelor Ski Patrol conducted an area search on Mt. Bachelor, but was unable to locate Wong. Deschutes County Sheriff’s Office Search and Rescue Deputies and Volunteers (approximately 20) responded to Mt. Bachelor and were assisted by the United States Forest Service. Weather conditions on the mountain consisted of fog, rain and sleet at times, making it unsafe to use aircraft. Wong’s friends described him as a very competent snowboarder, very fit with some mountaineering experience. Wong and his friends had traveled to the area from San Jose, CA, and had spent the previous couple of days snowboarding at Mt. Bachelor. Their plan was to return to San Jose on this date. With the assistance of Mt. Bachelor Ski Patrol personnel, a search plan was put in place utilizing ski teams, snow shoe teams and ATV teams. At approximately 8:15pm, Wong telephoned saying he had been out of cell service, but was alright and was hiking on a trail westbound towards Lava Lake. Search teams were then sent to Lava Lake and began hiking on the trail towards Wong. At approximately 9:57pm, DCSOSAR volunteers located Wong approximately ½ mile north of Lava Lake and in good condition. DCSOSAR transported Wong back to Mt. Bachelor Ski Resort, where he was reunited with his friends. It was learned that Wong did see the boundary signs at the top of Bachelor and decided to skirt them and travel to his right thinking he was on the front side of the mountain, but Wong did not realize he was on the south side of the mountain. Wong soon realized he was not where he thought he was and ended up letting gravity work in his favor and decided to travel downhill and towards a lake he could see in the distance. Wong ended up hiking about 7 miles after leaving the mountain until he was located. Wong did attempt to call 911 numerous times but was not able to. The Deschutes County Sheriff’s Office would like to remind those who are drawn to seek untracked snow on Mt. Bachelor, to be cognizant of the visible boundary along its perimeter. These boundaries will assist recreationists by guiding them back to ski lifts and the resort. On 04/18/2015, at about 1659 hours, Deschutes County Sheriff’s Search and Rescue was dispatched to a report of a hiker, Dyer, who had called to advise he had been wondering for 4 hours after having lost the trail. Dyer had spent the night camping with 2 companions, Cagle and Conner, and on their way back had become separated. Dyer had been making contact with his companions via text messages, but they had not been able to locate him. Dyer’s GPS coordinates were obtained from the 911 phone call showing that Dyer was about 2 miles south of the trail head, then about 500 meters to the east on the opposite south side of Soda Creek. Phone contact was made with Dyer to advise him to remain at his location until Search and Rescue arrived at his location. It was learned that Dyer’s cell phone battery was nearly dead at the time he called 911. Dyer’s companions were able to hike out to the Pole Creek Trail head without incident where they were advised to wait for Search and Rescue so further details could be obtained. 10 Deschutes County Sheriff’s Office Search and Rescue members responded to the Pole Creek Trail head where teams were deployed on the trail at about 2030 hours. Dyer was located at about 2150 hours where he was waiting by his tent with a fire and his dog. Dyer was escorted by SAR personnel back to the Pole Creek Trail head where they arrived at about 2310 hours. 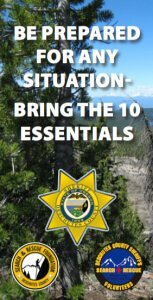 The Deschutes County Sheriff’s Office would like to remind those who recreate in the back country to carry the 10 Essentials. In particular on this incident the importance of a map of the area, a GPS and a way to recharge a cell phone would have proven to be very beneficial. Injured Climber: 20 year old male, John Dentley from Springfield MO. On 03/14/2015, at about 12:45 p.m., Deschutes County 911 received a call reporting that a rock climber (Dentley) had been injured by a falling rock while climbing in the “Picnic Lunch Wall” area of Smith Rock State Park. The call was made by Dentley’s climbing partner who reported the two climbers didn’t feel comfortable continuing their climb due to Dentley’s injuries and needed assistance. A group of 14 Deschutes County Search and Rescue (SAR) Volunteers responded to the area where they joined up with two other SAR members who had been climbing in the area and had already made contact with Dentley and his partner. The two SAR members were able to make an initial medical assessment and communicate by cell phone to SAR Command the extent of Dentley’s injuries and overall condition. With the assistance of the two SAR volunteers already on scene, Dentley was lowered to the waiting group of rescuers and assisted down several hundred feet of extremely steep scree covered hillside to the walking trail. Dentley was assessed by members of the Redmond Fire Department and ultimately sought his own medical treatment for his injuries. The incident appeared to be the result of natural causes. Deputies learned that Dentley has between one and two years of climbing expericence and was part of a larger group of students in the park from Yale University. Dentley told Deputies he was injured when a large rock he was holding onto, gave way and struck him as it fell. A total of 16 SAR volunteers worked with several members of the Redmond Fire Department in the Rescue of Dentley. On 01/27/15, at approximately 12:40 pm, Deschutes County Sheriff’s Office Deputies, Bend Fire Department personnel, Oregon State Police Troopers, US Forest Service Officers and Deschutes County Sheriff’s Office Search and Rescue Volunteers responded to the area of Dillon Falls, approximately ¼ mile downriver from the boat ramp for a fall victim. It was reported through 9-1-1 Dispatch, Chris Brinegar had fallen approximately 30 feet onto rocks near the Deschutes River and had suffered life threatening injuries. It was later determined Brinegar had been recreating in the area with a friend, had walked a short distance off trail and was on the rocks directly next to a very steep overlook of Deschutes River. Brinegar lost his balance and fell over the overlook, landing on rocks near the river. Rescue personnel were able to maneuver down the rocky overlook and secure Brinegar within a rescue basket. A technical ropes mission was then completed to raise Brinegar and the rescue personnel. Brinegar was then transported via wheeled litter back to the area near Dillon Falls boat ramp, where Air Link was standing by. Air Link then transported Brinegar to St. Charles Hospital in Bend with life threatening injuries. No foul play is suspected, but alcohol may have been a factor in this incident. Approximately 30-40 rescue personnel were utilized, who worked jointly for approximately 2 ½ hours to complete the rescue. On 01/07/15, at about 1:21pm, Deschutes County Sheriff’s Office Search and Rescue received a request to assist an injured snow shoer in the area of Todd Lake. Ms. Jensen had been snow shoe recreating with a group on Dutchman Snow Shoe Trail, near Todd Lake, approximately 1/3 of a mile north of the Cascade Lakes Highway. Ms. Jensen experienced a non-life threatening injury which left her unable to snow shoe back to her starting point at the Mt. Bachelor Nordic Center. DCSO Deputies were assisted by six DCSO Search and Rescue Volunteers. Four of the volunteers were deployed, operating two snow mobiles and two track ATV’s. Ms. Jensen’s group was located and they were transported back to their vehicles, stationed at the Nordic Center, where they declined any further medical treatment or assistance. Navigation-map, GPS, cell phone, compass, etc. Sun Protection-sunglasses, sunscreen, hat, etc. Fire-waterproof matches, butane lighter, etc. Repair Kit/Tools-multi-tool, duct tape, etc. Near Swampy Lakes Sno-Park, west of Bend. On 01/03/2015, at about 1553 hours Deschutes County Dispatch received a call of a skier that was having a serious medical issue at the Swampy Lakes Shelter, about 2 miles north of the Swampy Lakes Snow Park. Initial reports from Baker’s wife indicated that she had received a text message from her son which said John Baker of Bend was experiencing chest pains at the shelter and requested medical assistance. Cell phone reception in this remote area is limited but contact was made directly to John and David Baker by text messages from a nearby Search and Rescue Deputy to confirm the report and exact location. A member of Deschutes County Search and Rescue, who was on his personal sled and a U.S. Forest Service Law Enforcement Officer were snowmobiling in the area and responded to the Swampy Lakes Snow Park. Volunteers from the Deschutes County Sheriff’s Office Search and Rescue snow mobile teams assembled and prepared to provide additional assistance if needed. The on scene SAR member and USFS LEO assisted Bend medics by transporting them into the snow shelter by snow mobile. Bend medics evaluated and began treatment of Baker while Air-Link responded. Baker was transported by Air-Link to Bend St. Charles with life threatening medical issues. 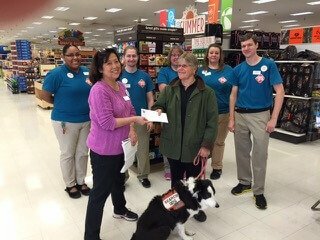 Sheri Kitanura, Manager at the Bend Shopko store, presented Carol Sanner of the SAR Foundation Board with a check to support Search and Rescue operations for Deschutes County. We are very grateful for the support of the local businesses in Bend – we couldn’t do our mission without it.